Lian Tiee Machinery Industrial Co., Ltd.
1. Lead edge feeder-sun automation (option). 2. AC inverter duty for main motor & vacuum transfer. 3. Double coating feed roller with different hardness to give accurate feeding. 5. Front gap, back stop with ballscrew and numerical key-in. 1. Auto zero, capable to return to the previous printing position and quick fix. 2. Order diagram display numerical control for user-friendly. 3. Top print with vacuum transfer and dust collector. 5. Dry unit with cold / heated air. 8. Auto ink wash system working by individual pump, with ink circulation and mode control. 9. AC motor inverter duty and adjustable air valve to accommodate different size of sheet. 10. Anilox roller up / down time can be preset. 1. Central yoke moveable, slotting phase quick set up. 2. Ball screw for slotting phase, knife running on register and depth driven by AC inverter motor with variable speed. 2. Equipped with automatic extrusion glue system from Vaico model NO: 350A. 3. Longer meter folding section for precision and flexibility. 4. Highly wear resistant and durable folding belts from Italy designed to be long lasting but also to leave the sheet un-marked during the folding action. 1. Manual stacking belt adjustment facility. 2. Photoelectric sensor allows the resetting of the number of sheet per bundle stack. 3. Automatic counter and spacer mechanism to assist the discharge of bundle stacks. 4. Adjustable press arm to maintain stability of the bundle stacks. 1. OMRON (PLC), relay, limited switch, hi-tech (HIM system), Mitsubishi inverter, KOYO encoder, TE magnetic contactor, overload protector. 3. 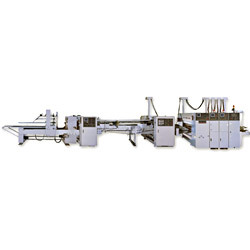 Feeder unit, printer unit slotting unit, rotary die unit at to movement. 4. Three different indicator and sounds on ink lacking, order working procedure as well as frame close and open up for efficient and secure environment. 5. Sensibly indicator and sensor for ink lacking to give ac curate inform. 6. Encoder and PLC system to keep machine working properly and unlimited with brake down from CNC computer. 7. Alarm apparatus for all of moving parts (motor overload, side guide, stopper slotting depth, feeding gap). 8. Chamber blade (ink auto circulation system) can be pre set from HMI program. 9. Separable power supplying system to prevent disturb control system on ever single unit. 10. 15" monitor screen for easy reading. 11. 10000 jobs menories capacity for quick set up. 12. Remote-control system including PLC unit for easy maintenance through cable.